For many urban commuters, a moped or motor scooter can be an economical way to zip around town. These gas efficient vehicles can travel up to 100 MPG, making them economically an excellent choice for your wallet as well as easier to find a parking spot for in congested areas. However, just like their faster siblings the motorcycles, these vehicles leave their riders vulnerable to injury during an accident and have their specific dangers as well. Most mopeds fall under this classification. 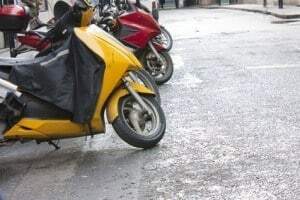 However many motor scooters may be classified under Illinois law as motorcycles, even though they are much smaller and slower. Riders would need to have a Class L license for these just like a motorcycle. Medical bills and lost wages can multiply fast when you are injured, causing even more problems after your moped accident. Don’t assume the responsible person’s insurance company is going to take care of all your expenses. Let our team of Chicago motorcycle accident lawyers help you get the compensation you deserve. We can handle the negotiations with the responsible party and their insurance company and get you the financial award you deserve. Our consultation is free, and there is no need to pay for our services unless we obtain compensation for your injuries. Contact us today!